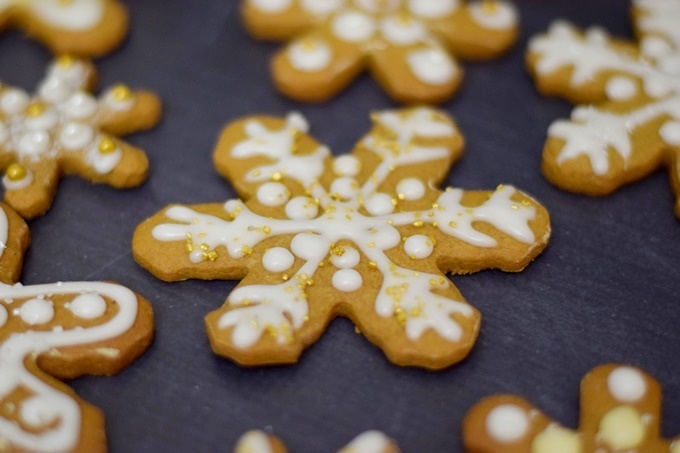 Beautifully decorated Gingerbread Snowflake Cookies laid out on your Christmas Cookie tray this year will make a delicious addition to all the treats set out for the holidays. 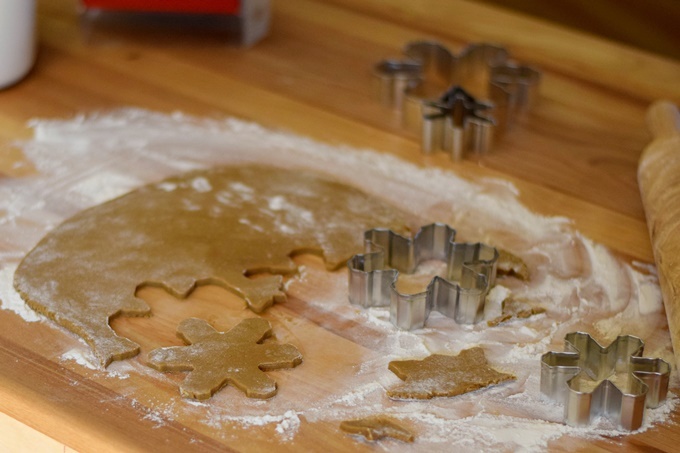 Today the Sunday Supper Family is breaking out the cookie sheets to share with you Christmas cookies for the holidays! 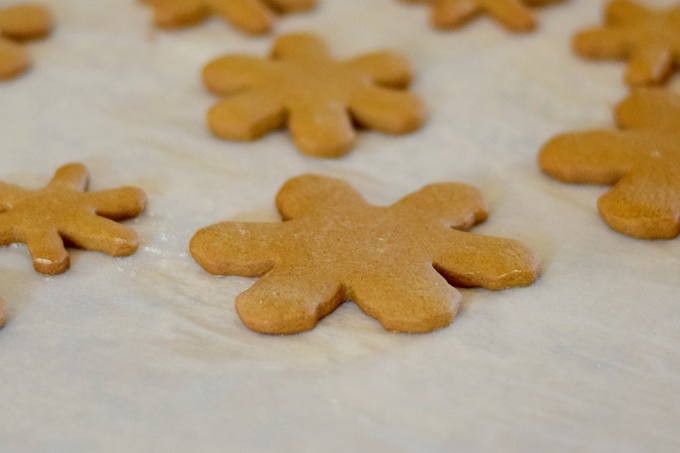 Gingerbread Snowflake Cookies are one of several cookies being shared with you today for our #Cookielicious cookie party! Making cut out cookies can be a real pain but for some reason I’m a glutton for punishment. While I hate the tedious work that can be involved in rolling out, cutting and decorating cookies, I usually am in love with the final result enough that it was worth the time spent. 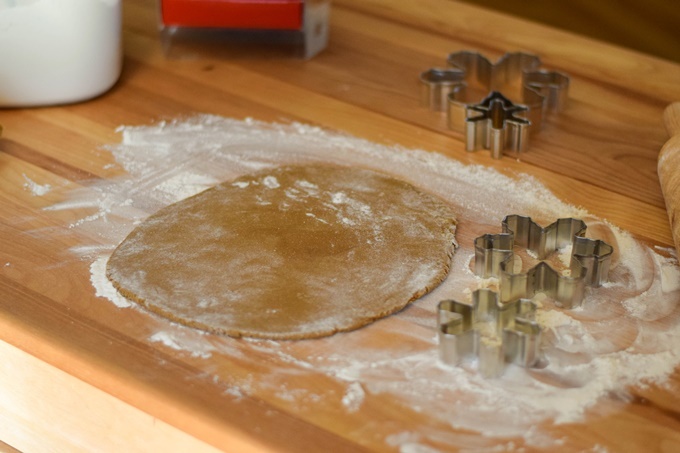 Making cutout cookies bring back many memories of baking with Nanny. When my first husband and I were separated I would have the boys with me every two weeks. I lived just around the corner from Nanny and pretty much every night we would get together after work. Nanny would come to my house or I would go to hers. On weekends we would work on making stuffed teddy bears for a special charity that I donated them to, or we would make cookies in preparation for that particular event. The cookies were always my cut out sugar cookie recipe that we would decorate together. I made cookies with Nanny all my life. 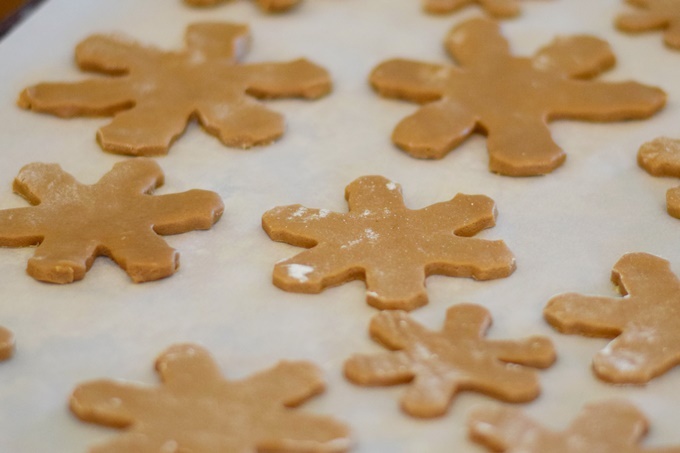 We would make them in her kitchen when I was a little girl, and I would watch as she would put together the dough, and then I would help her cut them out. We always had some with and some without frosting on top. However, most of us would choose the iced cookies when we had a choice! So, while decorating can be time consuming, I always think of Nanny when I am decorating. I think the end result and the reflection are worth it. Don’t you? Links to all #Cookielicious participants will be after the recipe! 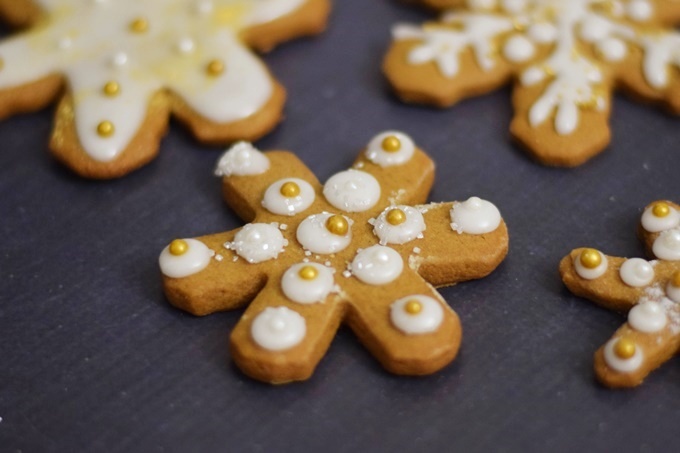 What are your favorite cookies to make for the holiday? Feel free to link up in the comment section! In a large bowl, cream butter and sugar. Beat in molasses and water. In another mixing bowl, combine the flour, ginger, baking soda, cinnamon, allspice and salt. Gradually add this to creamed mixture and mix well. Cover and refrigerate for 1 hour or until easy to handle. On a lightly floured surface, roll out to 1/4-in. thickness. Cut with 2-1/2-in. cookie cutters dipped in flour. Place 2 in. apart on parchment lined baking sheets. Bake at 350° for 10-12 minutes or until edges are firm. Remove to wire racks to cool. In a small bowl, combine frosting ingredients and beat until smooth. Transfer to a decorator bag with a small tip. 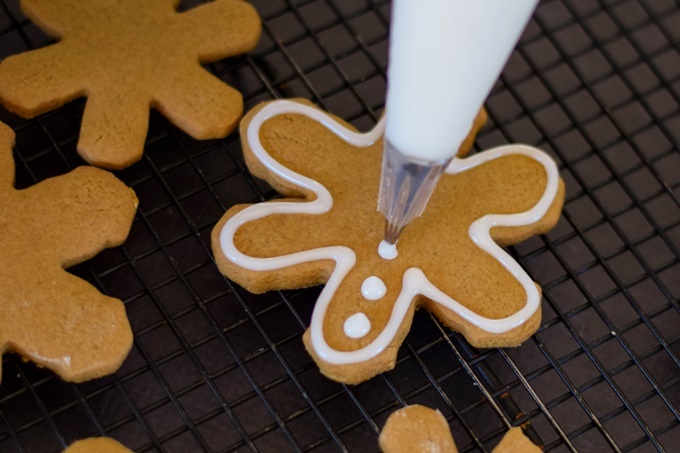 Cut a small hole in a corner of the bag; pipe frosting onto cookies. Yield: about 5 dozen. Follow Sunday Supper’s board The Cookie Jar on Pinterest. SO beautiful!!! I’d pick the frosted ones, too! I love that you made cookies with your Nanny!! They look fantastic! I have never made cut out or roll out cookies. I always scoop and bake. These look more than worth the effort though! These are beautiful! 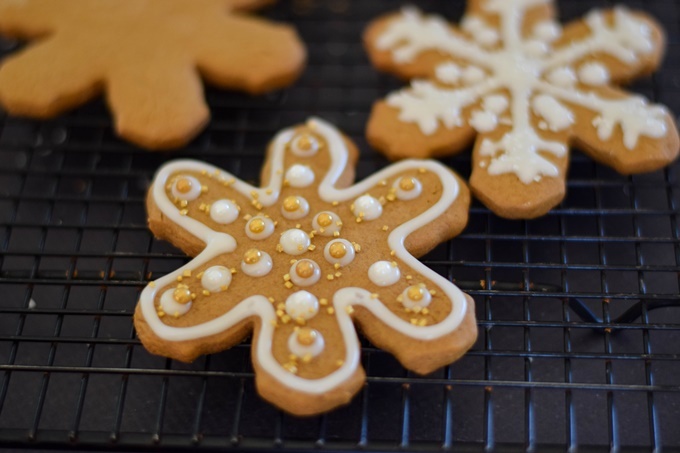 Love the gingerbread and these would look perfect on a holiday cookie tray! Absolutely stunning cookies – definitely worth the time spent. Cut out cookies always remind me of my grandmother. But we didn’t ice them – we used sprinkles prior to baking! Not a strategy used for gingerbread cookies, though. Such beautiful piping! I particularly love the accents. Absolutely gorgeous! I would love these in my cookie jar!